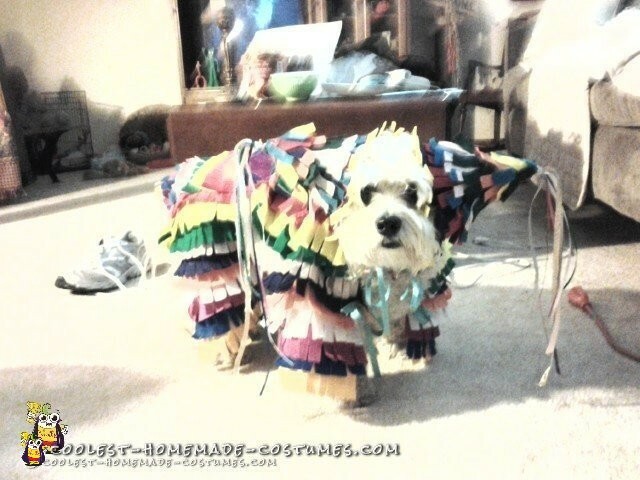 For my doggie Pinata costume, I took a pattern off one of my dogs coats for the proper size so I would know it would fit her. It was a cheap cotton fabric of white that I made the base of the coat out of, something light weight. Then I bought about 30 felt squares, 5 per primary colors. I cut each one of those in 3″ wide strips and folded over in half and sewed together at the edges to form a long strip of felt sewn together, then I cut the felt in ½ inch width down to the sewn edge but didn’t go through the sewed edge – just like a real pinata is made with tissue paper. When I had them all sewn and cut, I started to assemble the strips on the coat clear across the coat keeping the same color clear across, but varying the colors on each row, but keeping the same combo going through out the coat..red, blue, yellow, orange, green, white, etc. You can use as many colors as you want I just went with what the craft store had the most of. The legs I did the same way, I saved all the little scraps that I cut off from the body of the coat for the legs. I sewed satin ribbon to the coat to help tie the coat on my dog, neck, tummy and where it seemed she needed them. When she walked, at first she could walk right out of the leg section, so I had to have two ribbons on both front and back legs. The coat was longer than the coat I took the pattern off so only an little hung over but kept her tail free to preform normal doggie functions. The hat is thin card board from a legal pad, you could use party hats if didn’t have any so I made them, which I punched in holes on opposite sides and tied satin ribbon two the two outside holes and then the two holes touching each other I tied together, leaving them loose and not secured yet, allowing for adjustments when finished putting them together, should be the last thing you do so the look is right over the ears. Then I did the same technique as the coat, start with one color and rotate the colors accordingly starting at the top and going down the hat . I hot glued the felt on the hats. For the top hole I made tassels out of satin ribbon, tied them together and stuffed the knot into the hole and glued from the inside to hold it in place.